Spurred by the promise of gold, hungry adventurers flocked to San Francisco in search of opportunity on the eve of the Civil War. The city flourished and became a magnet for theater. 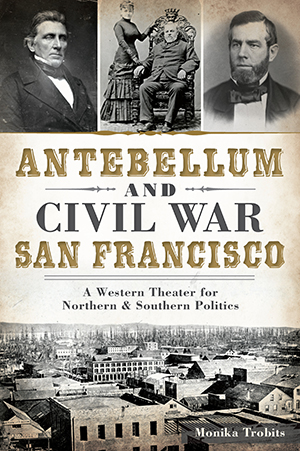 Some of the first buildings constructed in San Francisco were theater houses, and John Wilkes Booth's famous acting family often graced the city's stages. In just two years, San Francisco's population skyrocketed from eight hundred to thirty thousand, making it an "instant city" where tensions between transplanted Northerners and Southerners built as war threatened the nation. Though seemingly isolated, San Franciscans took their part in the conflict. Some extended the Underground Railroad to their city, while others joined the Confederate-aiding Knights of the Golden Circle. Including a directory of local historic sites and streets, author Monika Trobits chronicles the dramatic and volatile antebellum and Civil War history of the City by the Bay. Monika Trobits, a San Francisco resident for over three decades, established San Francisco Journeys in 2011. She will lead an Antebellum and Civil War San Francisco tour starting in October 2014. Monika holds a BA in history and political science from SF State University. She has been a docent and guide for the San Francisco Historical Society, San Francisco Urban Adventures and at SF City Hall. Her article "Dashiell Hammett's San Francisco in the 1920s" was published in 2011 in the Argonaut, a historic journal.